Evelyn said: "A very nice bookstore in Liverpool, kind of an "uncommon" bookstore. Unfortunately I've only been there once up to now (but I'm sure I will return). It's rather small, but very personal. Very relaxed, one of those shops where you don't feel the pressure that you "have to buy something", if you know what I mean. Also one of those shops where I could spend the whole day." The description of the bookstore, as an alternative, radical, feminist or community bookshop, has varied over the years but its aim has remained constant since - to provide access to books and information on the reality of the world and how to change it and ourselves for the better. Thus books on the History of Slavery find their place alongside manuals on Environmental Change, and volumes on Tai Chi or Feminism sit opposite Lesbian, Irish and Black fiction. 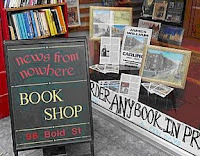 News From Nowhere Bookshop opened its doors on Mayday 1974 in tiny premises on Manchester St and in its 30 years of existence has moved three times before occupying its current site on Liverpool's bohemian Bold St. This 5-storey building is now owned by the Workers Co-operative which runs the bookshop as a not-for-profit community business, thus securing its future as an essential resource for the people of Liverpool. Subjects range from Labour History, Black Liberation, Irish Politics, and Struggles for Justice and Peace Worldwide, to Children's Rights, Women's Health, Disability Liberation, and Miscarriages of Justice. In addition there are large sections of socially-conscious Fiction and a vast array of Children's Books reflecting our diverse and multi-racial society. Local schools and the Education Authority use the bookshop as a major resource for equal opportunities and dual-language books. NfN is the coolest bookshop ever!! !